14 people die every day from diarrhoeal diseases in the WHO European Region, and these deaths are attributed to inadequate water, sanitation and hygiene. Access to safely managed water and sanitation services is crucial to achieving and maintaining good health and well-being, the aim of Sustainable Development Goal (SDG) 3: to ensure healthy lives and promote well-being for all at all ages. 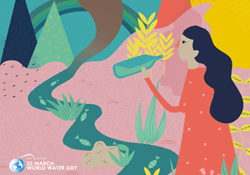 On 22 March, World Water Day focuses global attention on an issue that will play a pivotal role in the world’s efforts to achieve global development goals and, in doing so, to leave no one behind. The vast majority of all wastewater from homes, cities, industry and agriculture flows back to nature without being treated or reused, polluting the environment and losing valuable nutrients and other recoverable materials along the way. Instead of allowing this free flow of wastewater back into nature, it is important to limit the amount of wastewater being produced in the first place and, when it is generated, to safely reuse it. Recycled water can satisfy most water demands, as long as it is adequately treated to ensure quality that is appropriate for its use. In homes, for example, greywater – the relatively clean wastewater from baths, sinks, washing machines and other appliances – can be reused on gardens and plots. In cities, wastewater can be treated and reused for green spaces. In industry and agriculture, discharged water can be treated and recycled for cooling systems or irrigation. The costs of wastewater management are greatly outweighed by the benefits to human health, economic development and environmental sustainability. WHO promotes Sanitation Safety Planning (SSP), a step-by-step, risk-based approach to ensure the safe reuse of wastewater. The approach has proven to be a powerful tool in safeguarding human and environmental health throughout the entire sanitation service chain, particularly as the reuse of wastewater has increased. In 2015, more than 62 million of the 912 million people living in the Region lacked access to an adequate sanitation facility; 14 million lacked a basic drinking-water source. This same year, the world adopted the SDGs, including SDG 6: Ensure availability and sustainable management of water and sanitation for all. While the Region has seen progress in terms of increased access to clean water and sanitation for many, significant disparities remain and highlight the need for continued work to bring the benefits of safely managed water and sanitation services to everyone. At the same time, the consequences of climate change pose increasing challenges for providing such access. The Protocol on Water and Health, adopted in 1999 and currently ratified by 26 Member States, is an important tool by which countries commit to taking appropriate action to ensure clean water and appropriate sanitation for their people. On World Water Day, WHO/Europe, which fills the joint role of secretariat for the Protocol with the United Nations Economic Commission for Europe, emphasizes the critical role that safe water and sanitation play in the world’s efforts to achieve the ambitions of the SDGs. It encourages all countries of the Region to redouble efforts to ensure equitable and sustainable access to water and sanitation. In June 2017, participants in the Sixth Ministerial Conference on Environment and Health will discuss new responses to many of the challenges facing the Region, including those related to water and sanitation.